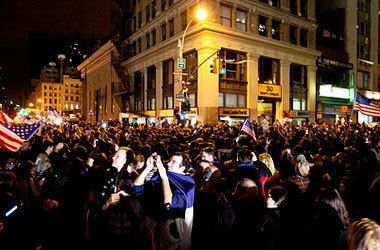 Celebrations at Ground Zero. Image: Dan Nguyen @ New York City via Flickr. For ten years, students have been recalling where they were when they first heard of the tragic events on September 11, 2001. Now, students will have the rest of their lives to reminisce what they were doing when news of Osama bin Laden’s death reached them late last night on May 1, 2011. At 11:35 p.m. EST, President Obama addressed the nation from the White House and confirmed reports that bin Laden had been killed. CNN reported that bin Laden was killed in a firefight with U.S. Special Forces in a compound, which was believed to have been built for the sole purpose of hiding bin Laden, in Abbottabad, Pakistan. No Americans were harmed in the conflict. In addition to celebrations at the White House and Ground Zero last night, college students all across the country took to their campus streets with American flags and chants of “USA, USA, USA.” As The Huffington Post pointed out, most of these students have lived with the reality of the War on Terror for over half of their lives. Watch as students celebrate at Penn State and on Boston Common. Videos courtesy of irishboy21556 and timlarew.